Melt butter in large pot. Add flour and whisk over medium heat for 3-5 minutes. Stir constantly and slowly add half & half. Add chicken stock, still whisking. Stir in package of dry onion soup mix and minced carrots. Simmer 20 minutes, stirring occasionally. Soup will thicken. Add frozen broccoli, salt & pepper. Cook until warmed through. Carefully transfer soup mixture to a blender and puree. Return soup to pot (or crockpot) over low heat. Add shredded cheese. Stir until well blended. 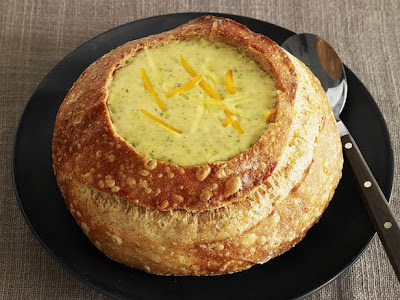 Serve in a bread bowl, or with toasted french bread slices (buttered and sprinkled with salt & parmesan cheese from the green bottle ~ pop under the broiler for a few minutes). Mmm mmm!